1.The Frame mount is the smallest, lightest way to mount your camera. 2. For use with the Hero3, Hero3+, Hero4 cameras . 3.Sleek frame design for low profile, compact mounting. 4.Engineered for optimal sound at speed. 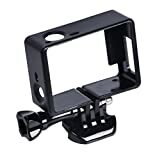 5.Includes: 1*Frame Mount, 1*bolt screw ,1*buckle mount. Note:The Frame mount is NOT waterproof and not optimized for use in extreme conditions where dirt and sharp objects can damage the camera lens. This entry was posted in Discount Photography and tagged 4/3+/3, Buckle, Frame, GoPro, Hero, Housing, Mount, Smatree, Tripod by Ball Photo. Bookmark the permalink.